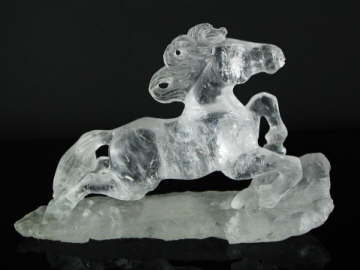 This exquisite Clear Quartz horse has been hand-carved to the highest standard, and comes from Brazil. It is an exceptional statue capturing all of the movement and beauty of these noble animals. Horses represent strength and nobility and in Feng Shui they symbolise endurance, courage and speed. Having such a carving in your environment is said to promote stamina and strength in all projects.